Pacific Rim 2 is finally happening and the movie is currently filming right now for a release next year. It took a little longer to get going than some fans of the first movie would have liked, but the important thing is, we will be returning to that cinematic world with Pacific Rim: Uprising. The sequel has added some new talent to the cast, including Suicide Squad star Scott Eastwood. Now, we have our first look at him on the set of Pacific Rim: Uprising. The photo comes courtesy of the Scott Eastwood fan page Instagram account, which shows his character all suited up in Jaeger pilot garb, meaning we are going to see him piloting one of the giant robots in the Pacific Rim sequel. 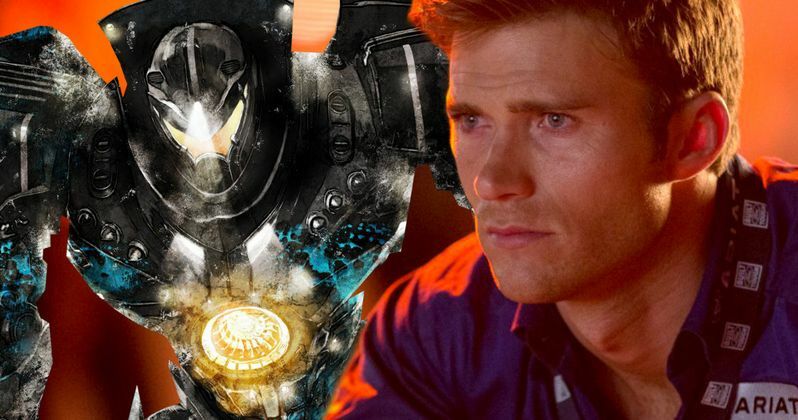 We don't know a whole lot about Scott Eastwood's character, but he is named Nate Lambert and based on the picture, it looks like he is going to be getting knocked around quite a bit in Pacific Rim: Uprising. It also isn't clear if he is going to be piloting one of the Jaegers from the first movie, like Gypsy Danger, or if he will be taking charge of a new giant, alien destroying robot. Outside of Scott Eastwood, Star Wars: The Force Awakens star John Boyega is playing the son of Idris Elba's character, Stacker Pentecost, who died a pretty heroic death at the end of the first Pacific Rim. Cailee Spaeny and Karl Urban have also joined the cast, which will see Rinko Kikuchi, Charlie Day and Burn Gorman returning for Pacific Rim 2, but Charlie Hunnam won't be back. It is fairly interesting that Pacific Rim: Uprising will be leaning heavily on new cast members, most of whom don't have a lot of "big name" recognition. That said, the big draw for something like Pacific Rim is giant robots fighting giant aliens, which doesn't rely all that much on a big movie star to accomplish effectively. Details on Pacific Rim: Uprising have largely been kept under wraps, since we haven't even been given an official synopsis yet, so these little social media teases are pretty much all we have to go on at the moment. Given that the humans managed to seemingly close the Breach at the end of Pacific Rim, it would appear that the problem was solved to some degree. That said, they just closed the breach and didn't actually deal with all of the Kaiju, so it would stand to reason that the creatures are going to find their way back to Earth some way or another, meaning that the world will once again need Jaegers to defend the world against these massive aliens, and those Jaegers are going to need pilots. Guillermo Del Toro directed the first Pacific Rim, but he is not returning in that capacity for Pacific Rim 2. Instead, it is Daredevil showrunner Steven S. DeKnight who will be in the director's chair this time around. Pacific Rim: Uprising is currently set for release on February 23, 2018. Be sure to check out the new picture of Scott Eastwood as a Jaeger pilot for yourself below.